Old Harmony school house. Now used as a hay barn. Nicholas Inmans', founder of Nixa, Missouri, old house. In last week’s issue, I introduced the subject of talking about the history of Christian County and doing some research. I had also mentioned about a couple of historical places around Christian County, including Halltown, (the old general store), and an old house located near Spokane in Reno Hollow. As I had promised in last weeks issue, I will be writing on part two of the history of Christian County, A Trip Back Into Time (part 2), as well as talking to local historian Wayne Glenn. I have included talks with both Bill Barnett and Sharon Whitehill-Gray as well. As I interviewed Wayne Glenn, I showed him some of the pictures that my husband, Chris Fitzpatrick and I took. Glenn sure was a lot of help in exploring the history of this area, as well as Barnett and Whitehill-Gray. The bottom photo is a house located behind the Nixa Hardware. The house used to be occupied by Nicholas A. Inman, who Nixa was name after in a towns meeting in 1881. Inman was a black smith from Tennessee. "The owner now of Inman‘s old house is, Gail Hedgpeth," says Wayne Glenn. Before the village changed names to Nixa, it was known as, Faughts. Due to Inman‘s years of services to the community, a towns meeting was held to choose a name for the "crossroads site" and post office. During the meeting, two suggestions were made. 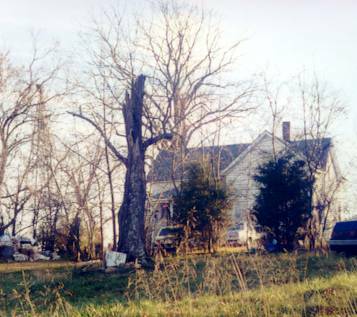 The first was to name the town after Nicholas A. Inman, while the second suggestion was to name it "Nix," because one of the townsmen said, "It best describes the community as it was, nothing but a crossroads." That‘s when they decided to use both suggestions. "Nix" and Inman’s middle initial "A" came together, and hence, the name Nixa was born. From what use to be an old school, is now used as a hay barn and is approximately 85 years old. The owner of the building is currently James Pollard. At the old school, there was an average of 25 students, ranging from the first grade through eighth grade. Like a lot of old schoolhouses, all of the children congregated in the same classroom. With teacher paychecks only being about $30 a month, they had to also serve as, custodians, stove tenders, coaches, counselors and nurses. 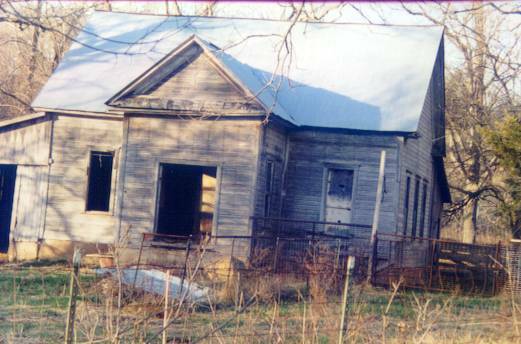 There are still some old schools--like this Harmony School House--that still stands today, although some of them may have been transformed into something different, just as the Harmony School is a hay barn now, while other schools have been torn down. Sharon Whitehill-Gray (executive director of the Nixa area Chamber of Commerce), Bill Barnett (the western district commissioner of Christian County) and Wayne Glenn (research writer), all agree that Christian County has grown phenomenally since the 1800’s. For Bill Barnett, he has lived in Christian County for approximately 35 years, and has been the Western District Commissioner for Christian County for the past eight years. "I’ve lived around Nixa for years and would like for Nixa to be the old Nixa in some ways, but we are just going to have to try and make things run right," said Barnett. "I like it because there is always something new coming up. It’s an exciting county and I think Christian County has a great future." Sharon Whitehill-Gray has lived in Christian County since 1985, and has been the Executive Director of the Nixa Area Chamber of Commerce for six weeks and comments, "Christian is a great place to live, work, and raise a family." After 50 years of living in Nixa, Wayne Glenn says, "I like Nixa and I wouldn’t live anywhere else." Glenn lived his first two years in Stone County and moved to Nixa, where his father had bought a place in 1949 and he still lives there. Glenn has been writing about the history of this area since his mid 20’s. "I have written some pamphlets, history of the Glenn family (genealogy), and things like that which were not real books, so really just last year is the first book that I did." His first book is called, "Mid the Hills." Glenn hopes for his second book to be out in the first part of August 2002, which is called, "A Photo History of Nixa and Vicinity." Glenn also remarked, "I love history. I taught history. I enjoy researching. I’m not really a writer. I’m a researcher. I can spend hours in a place like the library doing research. I consider interviewing people to be a research so I enjoy talking to people, asking them questions and getting feed back and hopefully you using things people say for ideas you can do something with latter but a love of history is why I enjoy writing." In Glenn’s book, "Mid the Hill’s" you can find all sorts of information pertaining to Christian County, (primarily on Nixa). Barnett believes that Christian County has approximately 54,000 to 55,000 residents. "Percentage wise, since the 1800’s, Nixa has increased about 1,000% or so," says Glenn. Glenn had also mentioned that about 100-years-ago, the population for Nixa was around 200, and from when he was a boy in school the town recorded a population of 509. According to the census records--provided to me from Whitehill-Gray, which she researched it from Glenn’s first book, since 1920 to 2000, Nixa had went from population of only at 370 residents to 12,124. So, as you can see for yourself, population for Nixa is and will continue to grow. From all this information that I have been provided, I would like to personally give thanks to, Bill Barnett, Wayne Glenn, and Sharon Whitehill-Gray, and would like to thank them for taking the time to talk with me personally. Stay tune for more updates and my book.